Mary Russell, a 15-year-old girl meets an aging beekeeper after she moves to a small English town with her aunt. She quickly discovers it’s a newly retired Sherlock Holmes. The two are an incredible intellectual match and Sherlock decides to take Mary under his wing as an apprentice detective. The friendship that grows between the two saves them both in a way. Mary is an outstanding character. She is smart and fiercely independent. She can take Sherlock’s rough demeanor and give it back to him in the same way. We watch as she grows into a strong adult and develops an incredibly keen eye. As for Sherlock’s world, it feels like King picks up right where Doyle left off. We get to see Watson, Mycroft and Mrs. Hudson again, such a treat for Sherlock fans. This novel is more character driven than Doyle’s work, but that made it all the more enjoyable for me. "It was none other than the long-suffering Mrs. Hudson, whom I had long considered the most underrated figure in all of Dr. Watson's stories. Yet another example of the man's obtuseness, this inability to know a gem unless it be set in gaudy gold." The mystery is well-plotted, but it’s more about the relationship that develops. Mary has a lot of guilt from her past and Sherlock has a hard time treating anyone like an equal. The two are good for each other. It moves slowly in parts, but it gives us a chance to see Mary develop and not just solve a single case. BOTTOM LINE: Loved it. It’s the first in a series and I already found a copy of the second book. If you enjoy Sir Arthur Conan Doyle’s original Shakespeare books than this is a great one for you. "That's what tears are for, you know, to wash away the fear and cool the hate." I read this for the R.I.P. Challenge hosted by Stainless Steel Droppings. Moore approaches each novel he writes with a sense of humor. The book is hilarious. He can write about the wildest things because his stories are tongue-in-cheek looks at the genre and the reader is happy to go along for the weird ride. There is definitely adult language and situations (the sewer hags are super creepy), so it’s not for kids, but I couldn’t help laugh out loud a few times. The book contains some truly great supporting characters, especially Minty Fresh. He’s a 7-foot-tall black man who owns a record store owner. He has an intimidating exterior, but such a sweet personality. I also loved the Hell hounds that appear out of nowhere to protect Sophie. The things they eat are hysterical. BOTTOM LINE: The book is odd to say the least, but very funny. I’ll definitely keep reading his work whenever I’m in the mood for something smart, funny and weird. 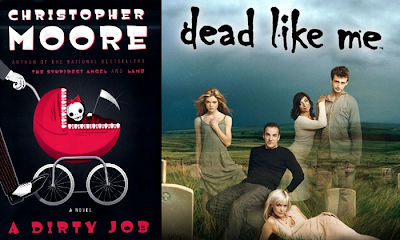 Pair with the TV show Dead Like Me. 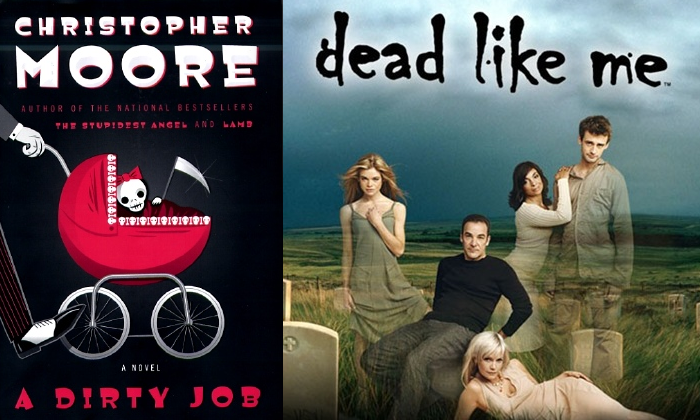 This dry comedy was about a young woman who dies unexpectedly in the pilot and finds out she’s become a grim reaper. It has the wonderful Mandy Patinkin in it too! 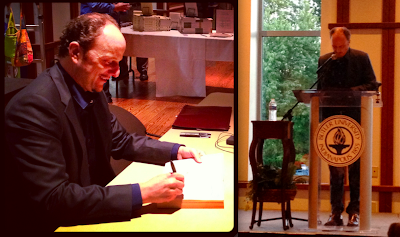 I recently had the chance to see Jeffrey Eugenides speak when he visited Indianapolis as part of the Butler University Vivian S. Delbrook Visiting Writer Series. Eugenides has written three novels, all of which I’ve read, and he won the Pulitzer Prize for his book Middlesex. He read a new unpublished short story called “Find the Bad Guy.” It was about a Texan and his German wife trying to make a marriage work despite a mid-life crisis. Throughout the reading he used accents for each of the characters. It was perfect! Within moments he had the whole audience laughing along with him. After the reading he answered quite a few audience questions. He talked about his different novels and how each one focused on a different part of storytelling. As his skill as a writer increased he chose to take each book in a new direction. For example, when he finished Middlesex he realized he wanted to write a book that gave the reader a look into the characters’ inner monologue, hence The Marriage Plot. I loved hearing about the journey that Middlesex took from originally being conceived as a short novel to becoming a mock epic. He thought it would be much shorter when he first began to research it. With each of his books he crafts intricate stories, painting vivid descriptions of his characters’ lives, and infusing the story with humor despite the serious situations. He also uses pieces of his own life in his novels. His Greek heritage, his travels, his childhood in Michigan, each book bears the stamp of his own life experiences. He spoke a bit about creating the characters in The Marriage Plot. He said that much of that book was based on his time in college. Mitchell particularly had many of the same experiences that Eugenides had in college. He traveled in Europe and India and even spent some time working for Mother Theresa. Each of his books is so unique and provides a different feel with each new story. Whether you love the books or not, you can’t deny that they make you think and offer you something new and original. I can’t wait to read whatever he writes next. Photos by me and my friend. which was banned for its depictions of slavery. I have an odd relationship with this book. I first read it in 2007 after Stephen King recommended it in Entertainment Weekly. I’d never heard of Gaiman before and I thought I’d check it out. Whoa. So as most people who have read Gaiman before might know, American Gods might not be the best place to start with his work. It is dense and complex. It has weird plot lines and skips across the entire country. And yet there’s something about it that just hooks you. After reading it I went on to devour Neverwhere, Anansi Boys, Coraline, Stardust, The Graveyard Book, Good Omens and Fragile Things. The first time I read the book I think I was so distracted by the strangeness of the plot that I missed the depth of the story. There's so much to take in and it's such a wild tale that I couldn't appreciate it fully until the second time. Part mystery, part fantasy, part character study, American Gods is a mixture of so many things. There are too many characters to mention, but each one is more creatively drawn than the last. A man name Shadow finds out his wife has died in a car crash only days before he’s being released from prison. Soon he meets a man named Wednesday and against his better judgment he agrees to work for him. The rest of the plot defies explanation, but rest assured it’s a wonderful ride. Whether Shadow is exploring the ineffable world of The House on the Rock or he’s hunkered down in a sleepy town of Lakeside, it’s hard not to root for him. BOTTOM LINE: Weird and wonderful, Gaiman manages to infuse his love of fantasy into an epic road trip novel. Re-reading this one doubled my appreciation for both the novel and the author. I was able to focus more on the overall story and less on the odd elements this time. This is not the best novel to read if you aren’t sure if you’ll like Gaiman. Read it when you already love his work and only if you like fantasy and aren’t easily offended. It’s banned book week (Sept. 22-28)! Every year I try to read at least one banned book during this month and this year I picked Bless Me, Ultima. I hope this week you take a minute to appreciate how lucky we are to have the freedom to choose what we read. Antonio is a young Mexican American boy living with his family in New Mexico. At the beginning of the novel the local healer, Ultima, moves in with his family. Ultima was the midwife who helped bring Antonio into the world and he feels particularly close to her. He is the youngest child in his family and as he grows up under the watchful eyes of his parents and Ultima he must learn what it means to truly lose your innocence. Despite their love and protection he bears witness to strife and violence in the community. The novel reminds me of many other American coming-of-age novels, especially Cold Sassy Tree. Bless Me, Ultima has a much more serious tone, but it shares many similarities of a young boy growing up in a tight-knit community. It consists of a string of connected events, more like a short story collection in some ways than a novel. It is set in the 1940s following World War II and Antonio sees the effects of PTSD first hand. He witnesses multiple deaths throughout the book, but none of them are gratuitous. The book touches on many issues that adolescents struggle with, like the division between the life your parents want for you and the life you want. It looks at the role of the healer in Mexican culture, the question of religion and the way a community reacts to tragedy. BOTTOM LINE: A coming-of-age gem and an important piece of Chicano literature. The play, written in 1900, tells the story of the Prozorov family. Three sisters, Olga, Maria, and Irina Prozorova and their brother Andrei, are living in the Russian countryside. Olga works and cares for her family. Maria is married, but falls in love with the visiting Colonel Vershinin. Irina is the youngest, an idealistic girl who believes she find her love in Moscow. Andrei has aspirations to become a professor and has fallen for a local girl, Natasha, of whom his sisters do not approve. The characters debate the meaning of life, the possibility of attaining happiness and more all while dreaming of a better life in Moscow. The first Act is full of hope and possibility, but as the play progresses and the characters’ lives begin to stagnant, that optimism diminishes. It’s a sad story, no one really gets a happy ending, but the dialogue throughout the story is so beautiful. There’s also a lot of humor worked into the writing. It speaks to Chekhov’s talent that every scene isn’t somber. At the end they are all left wanting something, wishing for more knowledge and a better life. BOTTOM LINE: I loved it. I hope I get a chance to see it performed someday. There are few plays I’ve read that show the drama of a crumbling family quite so eloquently. I’m almost out of Maeve Binchy books to read and that makes me incredibly sad. The Irish author passed away last year after writing 16 novels and a handful of short story collections. After finishing Heart and Soul I now only have one of her books left unread. I’m sure I’ll return to her earlier books again, but I hate that I only have one completely new story left to discover. 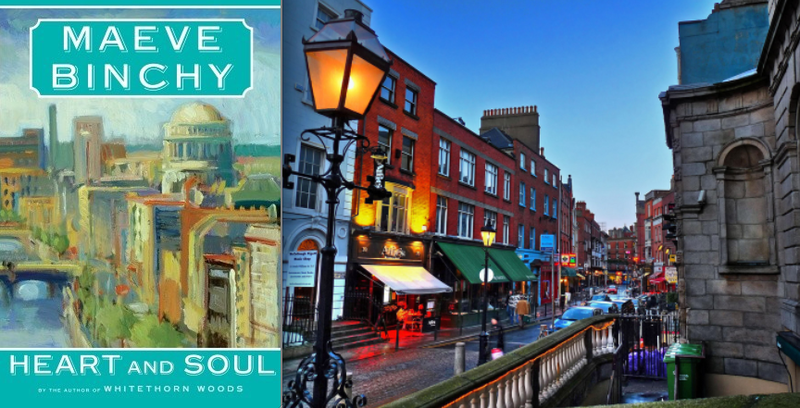 Heart and Soul is set in Dublin and tells the story of Clara, who is starting a new heart clinic in the bustling city. Despite a frustrating ex, two bratty daughters and a penny-pinching boss, Clara manages to get the clinic up and running with an excellent staff. She handpicks everyone from the nurses and dietician to the security guard. In Binchy’s trademark style we wander in and out of various characters lives, watching them fall in love, tackle new challenges and learn more about themselves along the way. This book includes many familiar faces. We reconnect with characters from her other novels, (especially Scarlet Feather, Quentins, Nights of Rain and Stars and Evening Class) and see how they are doing now. You don’t have to read those books to appreciate this one, but it’s a nice surprise to meet those characters again. I particularly enjoyed Anya’s story. She’s a sweet Polish girl just hoping to find some work in Ireland. Her sincere joy at life despite her ups and down was lovely. A few areas in the story faltered, like a section with a priest and a woman who is avidly pursuing him, but that wasn’t enough to detract for the overall book. BOTTOM LINE: If you love Binchy’s work then definitely pick this one up. She is a comfort read for me and I almost always enjoy her. Image of Dublin from here. Stairwell in a Chicago hotel. 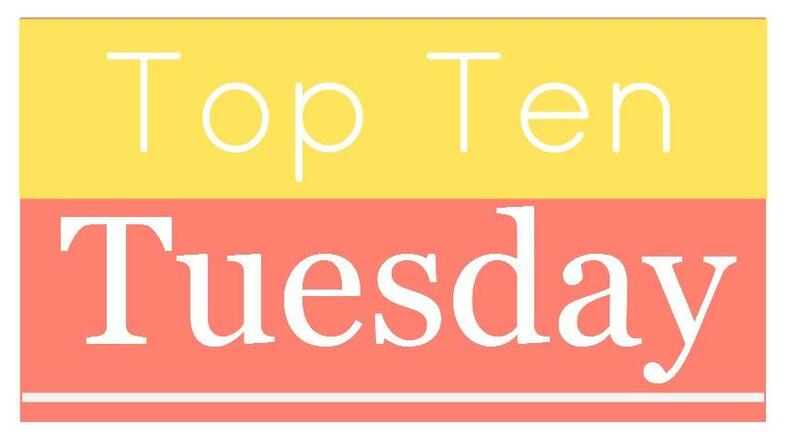 This week's Top Ten from The Broke and the Bookish asks for the Top Ten Books on My Fall 2013 TBR List. 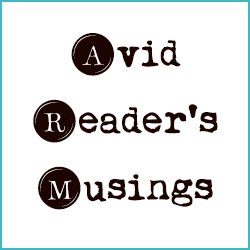 1) Among Schoolchildren by Tracy Kidder: It’s on my TBR Challenge list and my book club is reading it this year. 2) The Brothers Karamazov by Fyodor Dostoevsky: This beast is the last book I need to read for the Back to the Classics Challenge. 3) Dune by Frank Herbert: I’m really looking forward to finally reading this one. It’s been on my list too long. 4) The Cuckoo's Calling by Robert Galbraith: Caved to the hype. I love the Harry Potter books and I’m a fan of the occasionally crime noir. 5) Bless Me, Ultima by Rudolfo Anaya: I try to read at least one banned book each year and this is my selection for 2013. 6) If on a Winter’s Night a Traveler by Italo Calvino: Care and I are planning a laid back readalong on this one this fall. 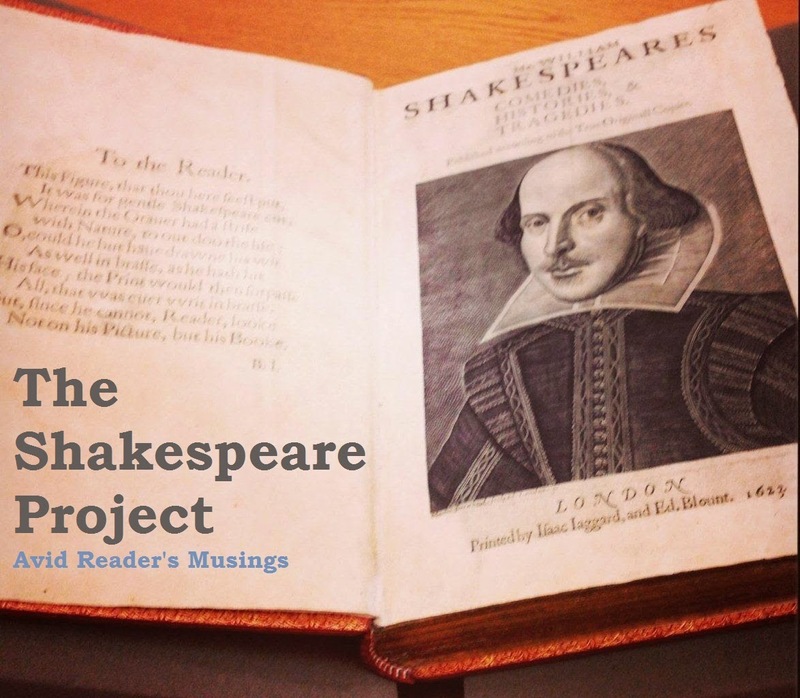 7) The Comedy of Errors by William Shakespeare: I’m a bit behind on my Let’s Read Plays challenge. 8) The Night Watch by Sarah Waters: All three of these final ones are books I’ve had my eye on for the annual R.I.P. Challenge. I love a good spooky story or mystery in the fall! Rereading a favorite classic at different stages of your life gives you different insights with each reading. 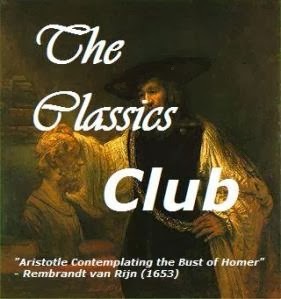 Is there one classic you’ve read several times that also tells a story about you? I’ve reread Little Women multiple times now. I’m endlessly fascinated by how the same book becomes new with each new stage of life. When I first read it I remember so much about the girls plays outside and having picnics. I remember Amy falling thorough the ice and the plays they put on for the Pickwick Club. When I read it in college I loved Jo’s adventures in New York. I remember Amy’s travel’s in Europe with envy. Then re-reading it this year I finally noticed Meg’s struggle to adjust to married life and the depth of the relationship between Jo and the professor. Marmee’s role really stood out to me this time as well. 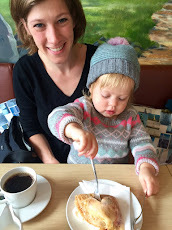 Her gentle guidance and encouragement shapes her daughter’s lives. I love how each time I return to a favorite book I discover something new. I’ve done this with all of Austen’s work and To Kill a Mockingbird and others, but this one has particularly felt like a different novel to me each time I read it. I think that says quite a bit about my identifying with different stages of life and choosing to focus on those when I read. Usually either coffee or red wine. Physical books all the way, but I’m finally used to occasionally reading on my kindle. Quentin in Paper Towns or Arthur Dent in The Hitchhiker’s Guide to the Galaxy, I love the quiet guys. The Sparrow, seriously it’s so good and the description of it makes it sound awful. The Diving Bell and the Butterfly, shows the true meaning of endurance. Reading Midnight in the Garden of Good and Evil in high school and realizing how fantastic nonfiction could be. Probably The Count of Monte Cristo or War and Peace. The Harry Potter series, every time I read it I don’t want to read anything else. Oh man, nine bookcases including two massive ones that take up a whole wall. Curled up on the couch with my pup. Not getting the chance to visit Oscar Wilde’s grave when I was in Paris. Sue Grafton’s alphabet series, I read one whenever I need a break from another book. Buying all of the books! A gorgeous 1916 copy of A Girl of the Limberlost from Half Priced Books. For the unbreakable people of that great city today. Grand Central Station in New York City. I am off on a hopefully relaxing vacation with the Huz. This week I'll be exploring the shelves of the Parnassus Bookstore in Nashville, touring Margaret Mitchell's house and museum in Atlanta, eating mahi mahi, visiting Hogwarts and reading to my hearts content on a sandy beach. Pardon my absence, I'll be back in about a week with pictures, books to review and a sunburn. In anticipation of my upcoming trip to Harry Potter World I just reread all 4,100 pages of the Harry Potter books with a friend of mine. Every time I reread this series I'm reminded of how wonderful these books are. I've already reviewed them on the blog (see the links to all the reviews below), but I just wanted to say that each reread reveals new layers of depth in the stories. The characters are so well-developed and complex, the epic plot is so perfectly planned out, the lessons taught are so important. I can't imagine a time when I will ever grow tired of these books. There are books that get under our skin and become part of the fabric of who we are. For me these are some of those books. I will continue to return to them whenever I need comfort or when I'm in a reading slump. They have never let me down. Photos by moi of the Central Library in Indianapolis and the pup. In Neil Gaiman’s epic novel American Gods he sets an important scene in Spring Green, Wisconsin (Chapter 5 page 117- 141.) That tiny town is home to one of the strangest roadside attractions in America. When I read the novel back in 2007 I assumed the House on the Rock was completely fictional. It wasn’t until 4 years later when I started making an annual trip to Spring Green to see a Shakespeare company perform that I made the connection. Just like in the book, you drive through a little town called Black Earth and you begin to see signs advertising the attraction. So during this year’s Spring Green pilgrimage my friend and I finally went to the House of the Rock and toured its wild exhibits. I re-read the scene from American Gods right before going and I couldn’t believe how accurate his descriptions were! Not only were the big things correct, but every detail was the same. There was a fortune telling machine right at the end of the road in the Streets of Yesterday section. The Infinity Room, the sea monster, the carousel, it was all there in vivid detail. The whole place has an incredibly creepy vibe. 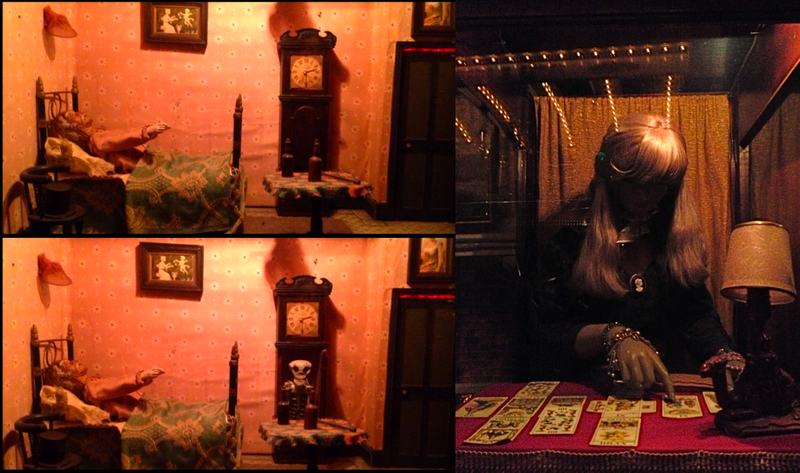 There are walls of antique marionettes and porcelain dolls. We couldn’t help but be surprised that a horror movie has never been filmed there. 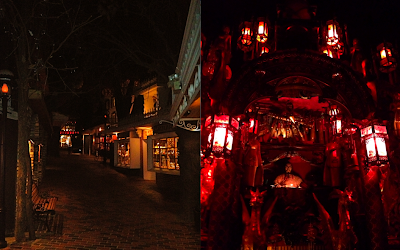 The labyrinthine home has low ceilings, carpet everywhere and the eerie cast of red light shines on everything. It feels surreal, like you’ve walked into a strange dream (or nightmare). The man who created the original house must have been an obsessive collector. You can almost see where his interests switched from object to object. There’s a collection of model ships that spans three floors! Another collection of antique guns, then airplanes, then model toys, then Japanese items; it just doesn’t end. I kept wondering what would possess someone to create something this elaborate in the middle of nowhere. It’s a complete sensory overload and when you finally make your way back outside you feel like you’re reeling from the noise and color of each new room. The excessiveness of the place is almost obscene. There’s not just one room with a huge collection of instruments that play themselves, there are about four! There is a peaceful Japanese Garden outside of the main warehouses and it’s a much-needed respite for people after they finish their tours. 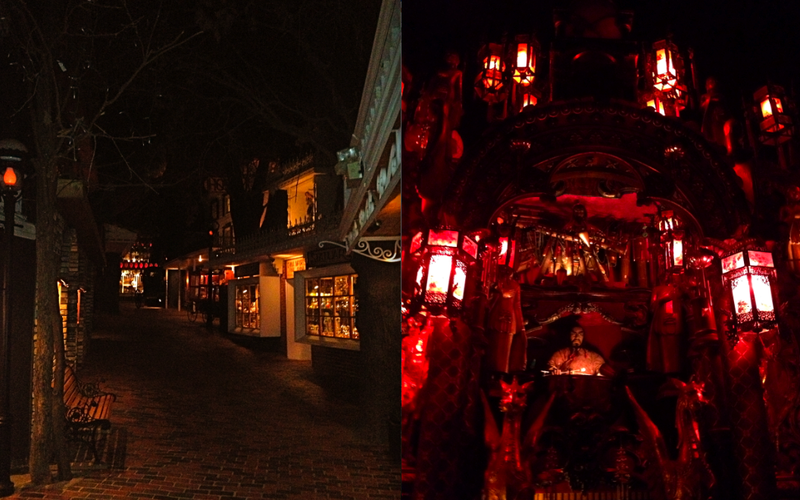 If you’re a fan of American Gods or of roadside attractions I would highly recommend visiting the House of the Rock. It’s a weird experience to be sure, but not one you’re likely to forget! express the Buddhist ideas of nirvana, a state of being beyond joy and sorrow." American Art Museum. The original is by Clover's gravesite in D.C. This week's Top Ten from The Broke and the Bookish asks for the top 10 contemporary books that would be great paired with a required reading book. I picked one classic and one recent book for each pair. 1) Howards End and On Beauty: These two are an obvious match. One is a book about the unlikely meeting of two very different families and the other is a modern re-telling of the same story. The two are just different enough to feel completely unique. 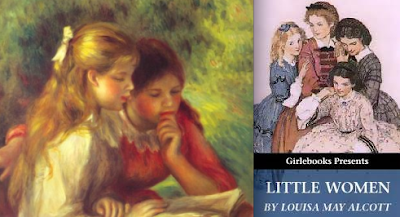 2) Little Women and March (by Geraldine Brooks): Four women grow up with their mother while their father is away fighting the Civil War. Little Women is famous for barely mentioning the patriarch of the clan, March tells his story. 3) Flowers for Algernon and Marcelo in the Real World: Two men with mental limitations try to find their way in the world. Both are characters that get under your skin and stay with you long after the final page. 4) King Lear and A Thousand Acres: Shakespeare and Iowa don’t seem like an obvious pairing, but the tragedy of a king and his daughters works well when retold as a Midwestern farmer and his troubled family. 5) Babbit and The Corrections: I think I’ve made it clear that I do NOT enjoy Franzen, but this pairing shows what works and what doesn’t. Both are books about unhappy Midwestern families, one does it well; the other just comes across as whiny. 6) Gone with the Wind and The March (E.L. Doctorow): A classic about the downfall of the South paired with a book about Sherman’s march through the South, burning it down as he goes. Bonus: Vanity Fair would be another great classic to pair with Gone with the Wind. The two share so much, including a kind and gentle heroine who is best friends with a selfish and ambitious woman. 7) A Moveable Feast and The Paris Wife or French Milk: Hemingway’s memoir about his time in Paris in the 1920s pairs nicely with the fictional version of his wife’s life during that same period. It would also work perfectly with French Milk, a twenty-something’s graphic novel about her trip to Paris. 8) The Sign of Four and The Sweetness at the Bottom of the Pie: Sherlock Holmes, the most famous detective of all-time and a 10-year-old with impressive deductive skills. Both have a hard time with normal social interaction, but they always solve the case. 9) The Iliad and The Odyssey and The Song of Achilles: Greek epic poetry can be daunting, but paired with this love story the characters might become more accessible. 10) The Secret Garden and The Forgotten Garden: Two novels about secret gardens, one meant for kids, the other with a gothic mystery twist.